The international media and the wildlife conservation community largely hailed China’s announcement late last year that it would close-down its domestic ivory market. Some described it as a game-changer and a huge blow to elephant poachers and ivory smugglers. Six months on, the debate on domestic trade in ivory remains a live issue in certain countries; while in some African and Asian countries, ivory carvings can still be found openly on sale to foreign tourists. Where domestic bans are proposed, such as in Hong Kong, the timing of the ban remains an issue. In other places, like the European Union, strict controls on domestic trade, rather than a ban, are being pursued. And, in all cases, what sort of exemptions should be allowed is part of the debate, with all countries allowing some form of exemption for antiques. During my seventh official visit to China as CITES Secretary-General in March this year, I saw first-hand the closing of the initial tranche of ivory carving factories and markets. Two years earlier, I had met Vice Prime Minister Wang Yang to discuss CITES and the ivory trade issue after opening the first ever workshop on reducing demand for illegal ivory, organized by the CITES Secretariat together with the Chinese government. The bold decision made by China since then will have a significant impact on the ivory carving industry and markets. It affects the processing, trade, and movement of ivory, and ivory carvings, both within and between the provinces, giving it extraordinary reach across the country. China’s decision followed a joint pledge made with the United States in 2015 to close domestic markets, and a call from CITES – the international agreement among 183 Parties that regulates international trade in wild animals and plants – at its triennial conference held in Johannesburg last October. The world’s governments decided at that conference that those countries “in whose jurisdiction there is a legal domestic market for ivory that is contributing to poaching or illegal trade” must “take all necessary legislative, regulatory and enforcement measures to close their domestic markets for commercial trade in raw and worked ivory as a matter of urgency”, recognising there may be some exceptions. This call from CITES reflected the level of global concern over the severity of poaching of elephants and the smuggling of ivory. It was one of a handful of times in the 44-year history of CITES that it has recommended the closure of domestic markets for a CITES-listed species in countries being affected by poaching and illegal trade. The message is clear. Countries decided to take such exceptional measures for good reasons. Although legal commercial international trade in elephant ivory was banned by CITES in 1990, poaching of African elephants has escalated in recent years with an estimated 100,000 killed illegally for their ivory from 2010 to 2012 (based on the CITES Monitoring the Illegal Killing of Elephants (MIKE) programme). The latest MIKE data shows that, while we are starting to turn the tide, poaching levels still pose an immediate threat to the survival of African elephants. Poaching trends in 2016 continue to be above the sustainability threshold, meaning that elephant populations overall are likely to be in decline. 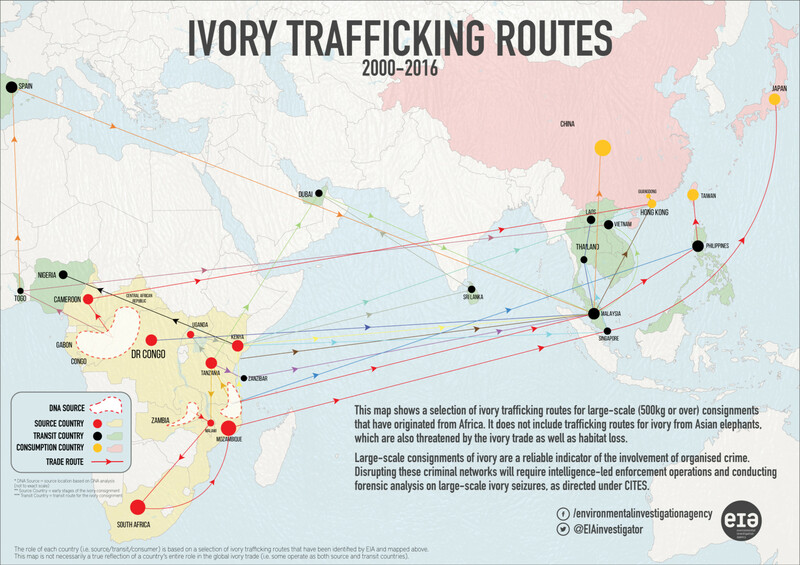 The industrial-scale, illicit trafficking in ivory is driven by transnational, organized-crime groups, and sometimes rebel militia targeting high-value wildlife species. It calls for a strong response that tackles both demand and supply. Criminal groups target elephants for their ivory, without regard for wildlife or people’s lives. They corrupt local officials, recruit and arm local poachers, create insecurity and propel local communities into a poverty spiral. The ultimate goal of the closure of any legal domestic ivory market is to stop the illegal trade in ivory by preventing the opportunity to launder illegal ivory into legal markets. It is unlikely that banning legal domestic trade will, in itself, end the demand, but it may have an influence on the price of ivory in black markets. Research by Save the Elephants shows that the wholesale price of raw legal ivory has dropped by almost two thirds since China announced its plan to close down its domestic market. The ban however does not negate the need for ongoing law enforcement and international cooperation across the illegal trade chain as well as well-targeted campaigns to reduce demand for illegal ivory. CITES has requested key implicated range, transist and destination countries to develop and implement National Ivory Action Plans with targeted and time bound measures to improve legislation, law enforcement and public awareness. This is an innovative tool used to address high levels of elephant poaching and illicit ivory trafficking. It provides a highly successful approach to dealing with a complicated and multi-faceted problem, and encouraging progress has been made. China has taken bold decisions and is acting on them, as have other countries, such as Kenya, Thailand and the United States. Yet we all have to do more. Through a collective effort that cuts across government, civil society, local communities and the private sector, we will win this fight.